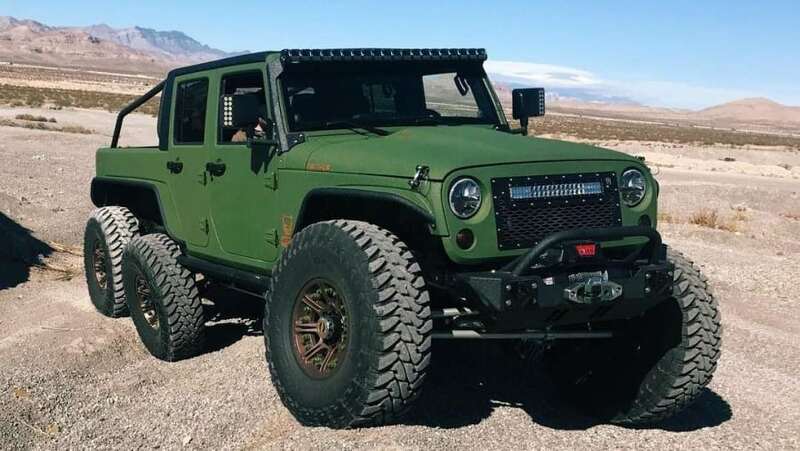 Modified Army Green Jeep Wrangler 6×6: Wrangler is one amazing off-road partner and this typical 6×6 variant with Army Green finish takes this adventure-filled driving style to the next level. 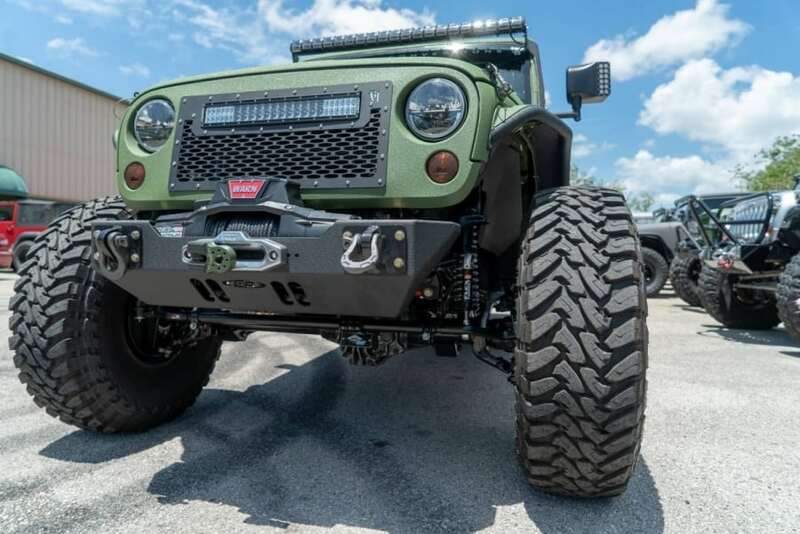 Not many brands have vehicles that are stock fitted with six wheels and thus, modifiers have a huge scope of shifting ordinary machines to this category by adding stronger suspension and an extra pair of wheels. 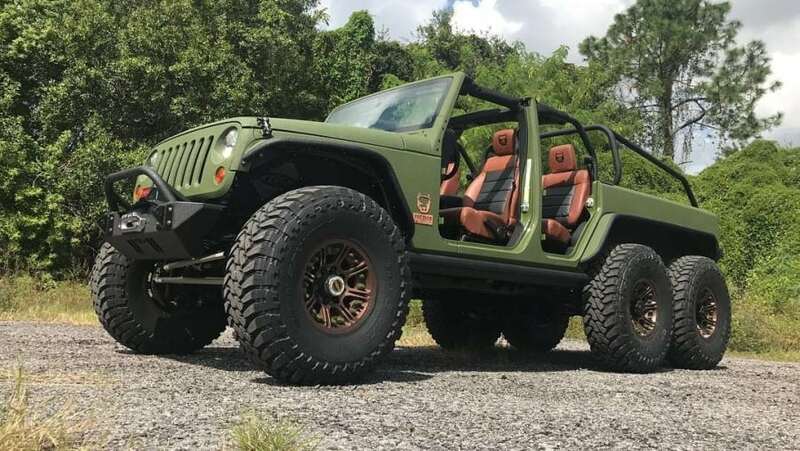 Bruiser Conversions from Florida had a different result in mind with their stock Jeep Wrangler and from day one, it commanded impressive levels of respect from car enthusiast around the world. The lesser-known beast was first seen last year at SEMA auto show. The modifier has offered an open top body design with a flat deck at the rear and protective bars all around the car. 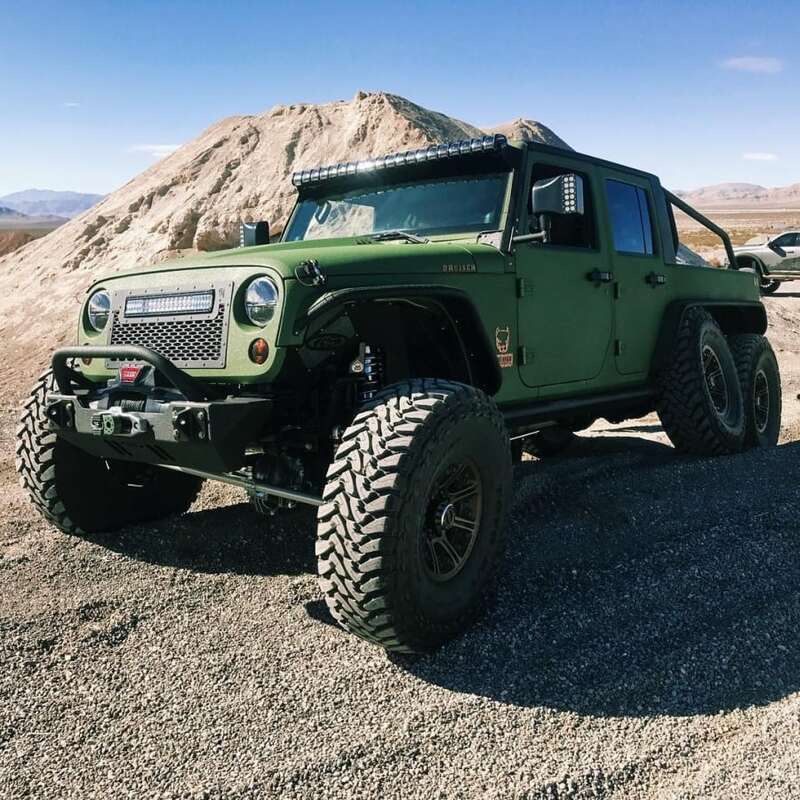 Both the rear wheels are aligned under a single fender whereas front body gets a slight modification to support that huge Mickey Thompson tyre for additional off-road ride benefit. 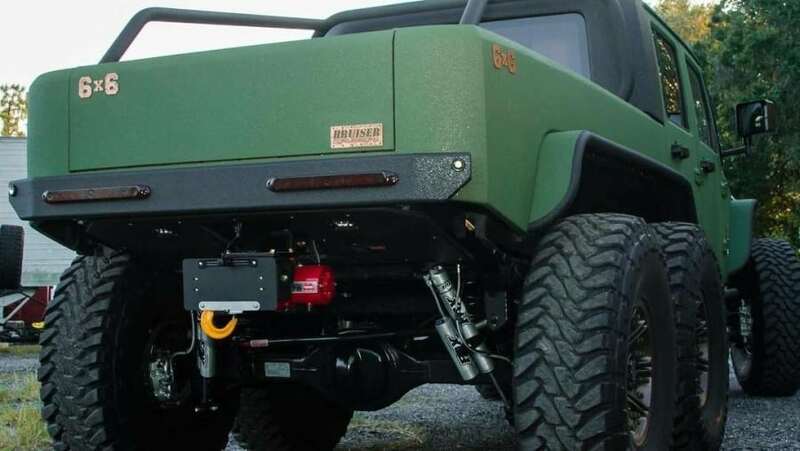 All changes have resulted in increased ground clearance for better dune bashing, rock climbing, and even water wading. 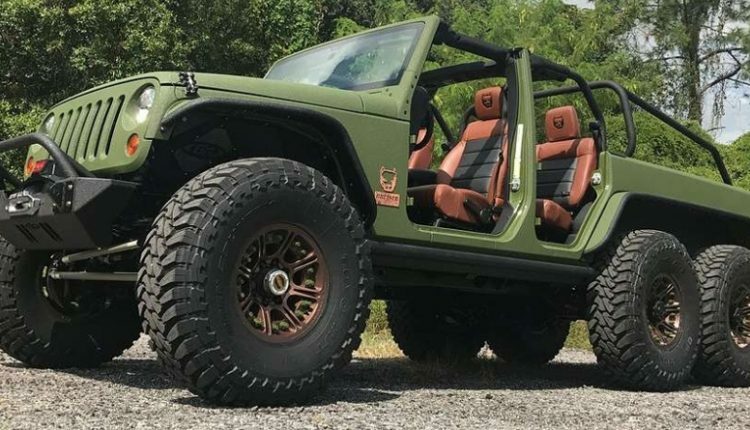 Apart from the extra set of wheels, Jeep Wrangler used here comes with better suspension parts, all new rear view mirrors, LED lights at all ends and steel bumpers wit better approach as well as departure angle. 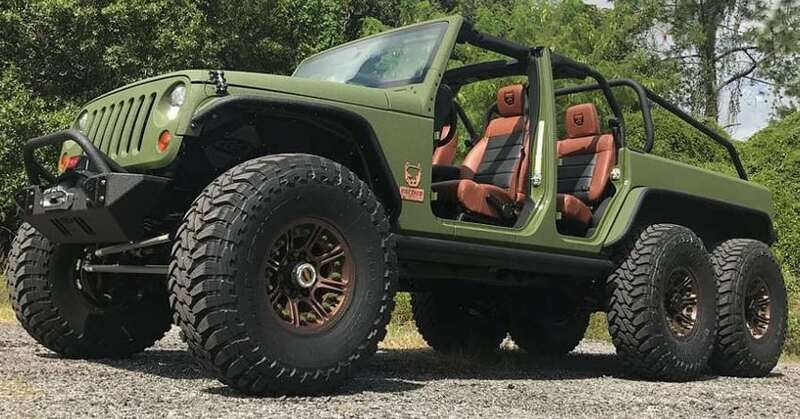 Apart from the visual upgrades, Jeep Wrangler by Bruiser Conversions is offered with a GM-sourced V8 engine producing 450 HP of maximum power and 610 NM of maximum torque. 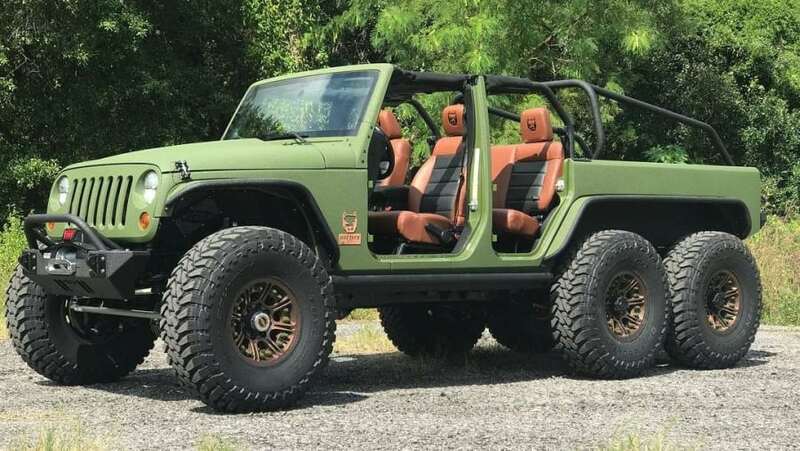 Those looking for even more power can get Hemi V8 engine from Dodge installed into their custom Wrangler. Indian automotive segment is not doing justice to Jeep products as they are brought through CBU route and thus, high amount of taxes take pricing to an all new level. 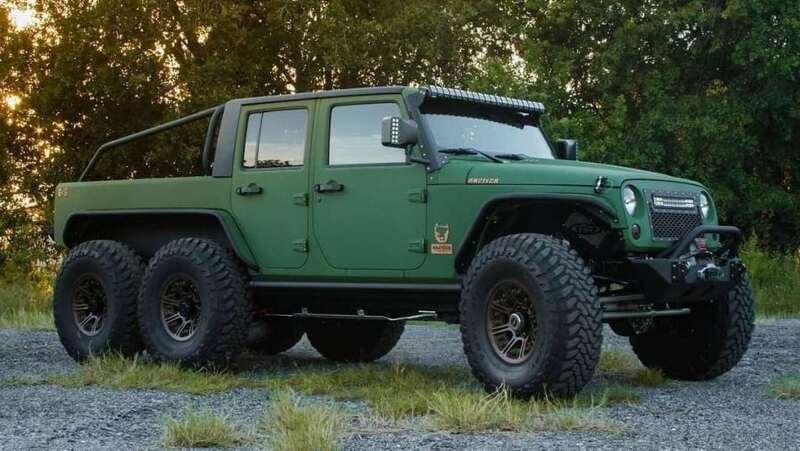 More than that, customizers have worked on 6×6 Thar for getting an almost similar visual appeal on our roads. 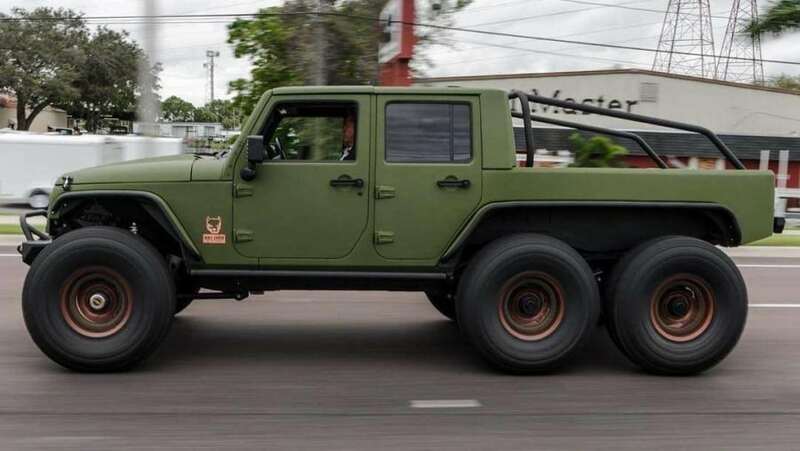 Getting Jeep Wrangler 6×6 would require a huge amount of money here.